Almost exactly a month ago, I went down to my laundry room to transfer loads, but I was too early by a few minutes. I sat down on the steps to wait and chat with my neighbor who was outside tinkering with his bike. As we rapped, I saw a hummingbird zinging around like Tinkerbell. Hummingbirds are my favorite, and always have been. Once someone told me that they were a Native American symbol for Joy ... I've felt it every time I've seen one. 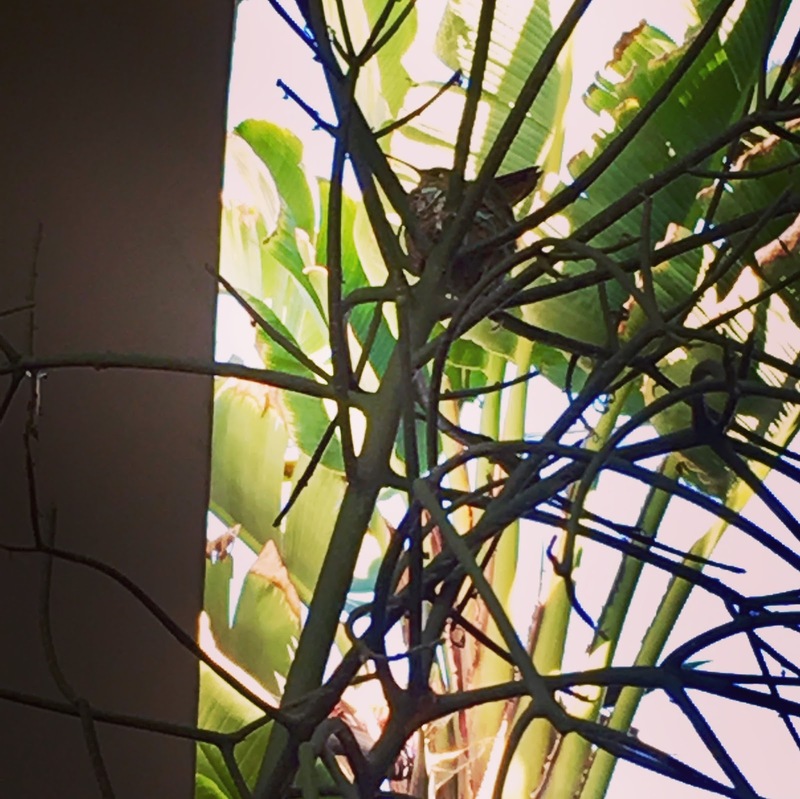 This particular hummingbird all of a sudden stopped darting around, and came to rest on a branch in one of our potted trees. Like, chilling. You don't see that too often, so I was almost concerned ... until I saw that she was chilling atop what appeared to be a tiny, little nest. 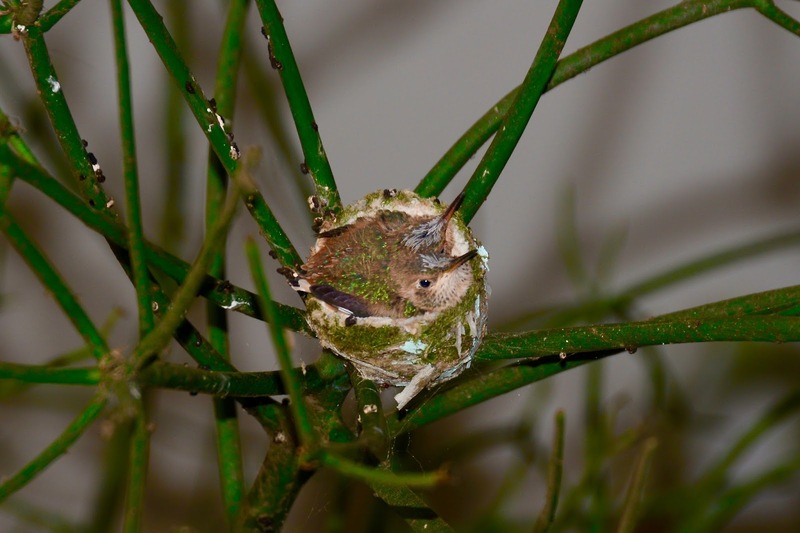 A NEST!!! 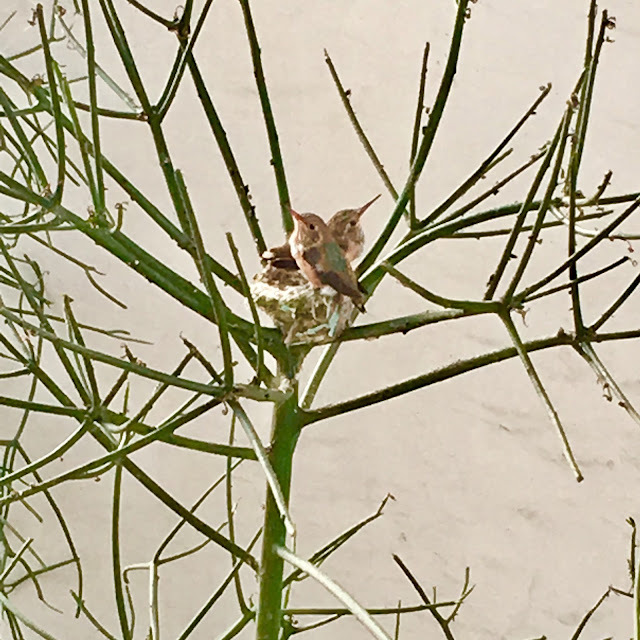 I've never seen baby hummingbirds in real life, so I was immediately filled with excitement and awe. And so began the month long vigil I've kept outside my door. I read all about the birds online. I shared every stage of progress on Social Media. I fully dorked out on it, even when they were just eggs. One morning, one of my neighbors texted me to say that they had hatched! I don't even think I put on real clothes before running to look outside. Sure enough, there was the Mother (who I'd named Frida. She seemed feisty. ), going back and forth between the nest and another tree with a Bird of Paradise flower up high that appeared to be her source for the nectar she was bringing back to feed her babies with. I saw her feeding them, and even saw one of the babies seem to spit up! My neighbors and I would stand out there and watch them, only whispering in hushed tones of awe. We pretty much all became bird nerds. It couldn't be helped. As the babies revealed themselves to be seen for the first time on Valentine's Day, I dubbed the twins Valentino and Corazon (Spanish for Heart), and feel completely in love with them. Like, we spoke about getting tattoos of them level of love. Then one day it was super windy and stormy outside, and I got a text from one of the neighbors saying the tree with the nest in it had blown over! The Mother had found a spot that was covered and protected from the rain, but that was also a bit of a wind tunnel between the buildings when the gales blew. Plus, the tree was a flimsy one. The entire thing was lying on its side, with the little nest clinging to the top, the tiny babies still inside, peeping for help. It was dire. They propped it back up, and dug a hole in the dirt to place the pot in, preventing it from being able to blow over again. A friend found me the number of a hummingbird rescue woman (THANK YOU, TERRI! ), who I tearfully left a message for, concerned that the Mother wouldn't return and they would die. With all that's been going on in the World at large, these tiny babies had become a little bright spot, and we were extra invested in them now ... as were all my friends who I kept Facebook updated. The Plight Of The Hummingbirds! Terri had told me that Mother hummingbirds feed the babies every half hour, so I could watch and see if she returned. 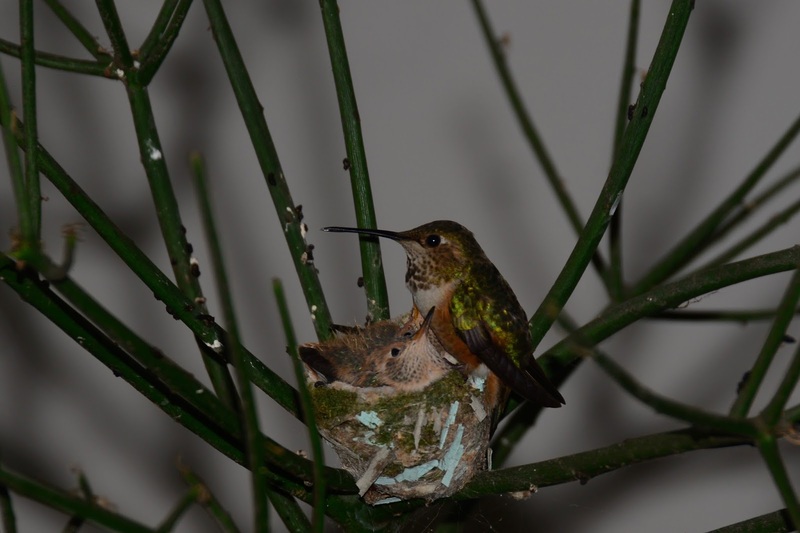 I went out there and was rewarded almost immediately by Frida winging her way down again from the Bird of Paradise, and settling back in the nest to feed. She was back! The babies were fine! I was relieved almost to the point of tears (again). These were Venice hummingbirds after all ... Tough. The Mom seemed to know that I cared, as she would just sit there, even when I got close. The same was not true for my male neighbor, who she swooped down on when he raised his hand up. I dug her. The online information and Terri had given me very accurate time tables for when things would occur, and we watched the babies' feathers come in, and their little bodies get bigger, until there was almost not room enough for them both in the nest anymore. It goes so fast, merely three weeks! My phone camera could never really get in there close enough, so I called my brother Paul to come over with his legit camera and zoom lens. He was out there while I made dinner one evening, and came back inside with a little smile, knowing that I was about to freak out. I mean, LOOK at their little faces! It was incredible (and NatGeo should hire Paul!). 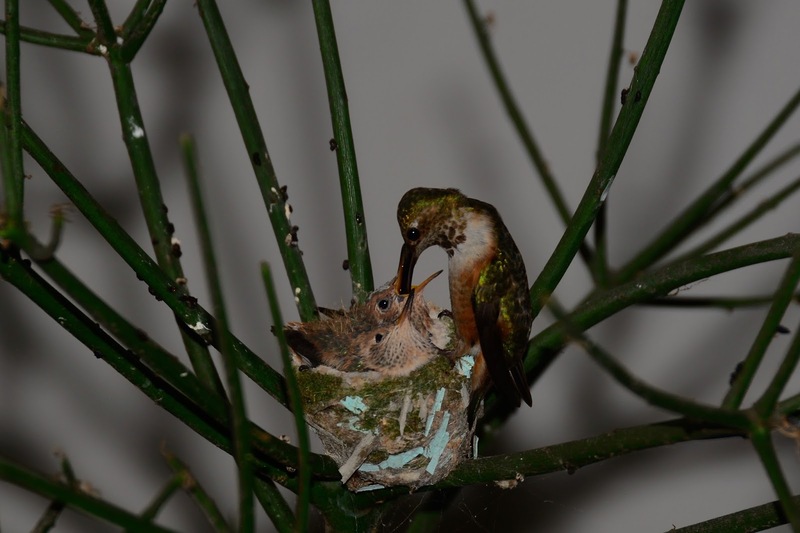 Every site I read about the birds on said it was a rare thing to see the babies, and we treated it all as such. A sign of good luck, an omen of joy. I had friends come by to see them, and it was a treat to see each one of them soften with awe and a true sense of wonder, as I'm pretty sure everyone alive gets a kick out of hummingbirds, at least a little. Last Friday, I came home and saw Valentino and Corazon both balanced on the edge of the nest, looking like they couldn't fit. It was a few days early from when I thought they'd leave (according to the experts), so I watched for a couple minutes, then sped off to where I had to be. I figured we had a couple days at least, but it was the last I saw of my little feathered friends. I came downstairs Saturday morning to find an empty nest. I was already having a kind of sad day, so seeing the vacant bird home made me even sadder. And it was raining again. Everything just felt bad in the World all at once. I walked in the rain to get some coffee at The French (where they knew ALL about the birds, and were maybe even a little sick of my gushing about it). I showed a friend there one of Paul's photos and as I watched their jaw drop, I realized how cool it had been that we had had these friends in our lives at all. How great is it that I EVER got to see a little hummingbird nest and watch the whole process right up close?! I've always been able to find happiness in the little things, and these little things had given me an abundance of happiness for a whole month. We were lucky souls. I had to write this to remember that, and share it with you so that we might all be inspired to find joy in nature, and in everyday miracles. We need that now more than ever. I think a perfect homage (and lifelong reminder) for Venice hummingbirds is probably a tattoo. Yes. So will I. Be a hummingbird!